Nurse burnout is not discussed. There, I said it. A bit of personal experience related to this- I asked my virtual assistant (VA) to perform a search. As a nurse blogger, I want to be sure that my blog is getting found and read by nurses and nursing students. So, I had my VA go to Google and start typing in words and phrases related to nurse burnout. 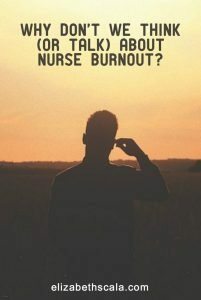 This way I could understand what nurses were searching for related to burnout… and ultimately be able to help them by providing relevant content that they wanted/needed on this blog. Using a keyword tool provided by Google, I was astounded. They were searched very little. Search numbers ranged from 10-1000. One thousand!?!? That’s it!! Are you kidding me!? One the reasons why nurses keep pushing themselves through burnout is because they do not even know that they are experiencing it! Many organizations do not have the time or resources to teach their nursing staff about burnout. The organization themselves does not know what to do about burnout and so it is not dealt with properly. The nursing literature is limited. Studies are lacking and when nurse burnout is studied it is done with small sample sizes, weak study designs, or as a secondary variable. We need to talk about nurse burnout. Help nurses and nursing students realize that, “Hey, this is normal. I am not alone here.” Burnout is common- it is often everywhere. So, we need to stop brushing it under the carpet, making nurses feel as though they have done something wrong. Ask experienced nurses to share their burnout stories. That’s right. If you speak to a mentor, someone that you look up to, and ask them to tell you their burnout story… they are likely to have one. Or many! Instead of acting like burnout does not happen, let’s learn from it! Have these nurses with more time or experience share with the newer nurses that it is normal to feel this way. Begin early. With nursing school. If you are a nurse who works in nursing education, consider bringing nurse burnout to the next curriculum planning meeting. Or, if you don’t work in formal education but are involved in some way with your organization’s staff education department- bring the topic of nurse burnout there. Have no hand in formal education? Bring it up at staff meetings, journal clubs, or in any way that you can. Even you, as an individual nurse (or nursing student), can start these conversations. And start them early. Invite experts in to help. Maybe the discomfort with speaking about burnout comes from the fact that you don’t feel you know enough about it. No worries. There are many nurses out there who specialize in this field. 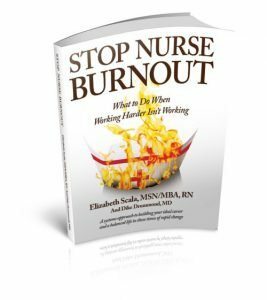 Nurse coaches, holistic nurses, nurse speakers, and nurse authors have dedicated their work to helping nurses with burnout. Make the commitment to find professional support for you and your nursing colleagues. What would you add? 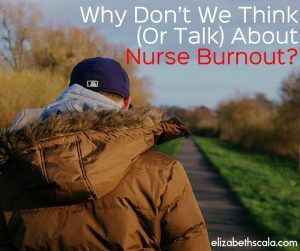 Do you have conversations in your nursing world about burnout? How did they start to happen? What made them a part of the agenda? Share below, and thanks for reading! You are so on target, Elizabeth. I recently wrote a blog on burnout as well and a nurse leader wrote to me, “Thanked you! I now know I’m not crazy.” This is still a young discussion, in terms of awareness, understanding and how to bring it out of the closet. I’m remembering how cancer wasn’t talked about, or alcoholism or domestic violence, but with dedicated activist voices, we do now. As someone who has come out of the closet on many occasions and for many different reasons, I know it becomes easier. I greatly appreciate this work you are doing and because of you, I’m speaking and writing about it. Personally, I recently felt the beginning signs of burnout and because I knew the signs, I could recognize it and address it in healthy and sustainable ways. With much love and appreciation for bringing your voice and work into the world. Thank you so much, Jackie. And I couldn’t agree more… when we have the awareness of this (or anything that is not supporting our highest self), we can make changes as we need. Because it is so true. Burnout does not just happen to us once in life. And it can come back again and again. It is our own awareness of being able to recognize this and make the necessary adjustments. Appreciate your feedback, always. Thanks!!! Thanks Elizabeth for labeling the problem. Talking about it is a start. I too looked for suicide/burnout statistics of nurses and could not find it but there were references for physicians on this topic. On another point, there are 2 components to preventing burnout- the role that the nurse has to play in committing to taking good care of his/her self. The other is the importance of seeing the responsibility of the organization one is working for. As a nurse entrepreneur, I recognized the symptoms for myself recently and was able to address them quickly because I am the employer! At one point in my nursing career, I was involved in unionizing the nurses in our hospital so that we could speak as a group on behalf of all nurses to improve our working conditions. I am currently a part time RN employee in an organization which takes out 1/2 hour’s pay if you work over 5 hours. It is not negotiable, you don’t get paid for working through your break. So, managers are encouraging the nurses to take that time.It seems the healthcare and nursing cultures are changing, which is hopeful. On top of that, I have such hope with the kind of work you are doing by addressing this with nursing students.Burnout is preventable and treatable. Change may happen from the bottom up. Employees caring for themselves by establishing healthy boundaries, sharing stories of experiences and strength and uniting for making changes for improved staffing ratios as a start. Institutions are changing also as a result of studies and in response to the economic benefit of good working conditions for employees. I couldn’t agree more, Padma! You will be seeing another post coming out next month in this series that talks about the way that both individual staff AND organizations that employ them need to work together on the burnout issue. Thanks for sharing your insights and experiences, much appreciated! Hmm, what do you mean by that, Lisa? I completely agree! We need to encourage this conversation and keep it going! Thank you for sharing your passion and this valuable information! You got it! Glad you enjoyed the post, thank you. Great article! I teach first year nursing students and will now start a conversation in post conference time to start them thinking!